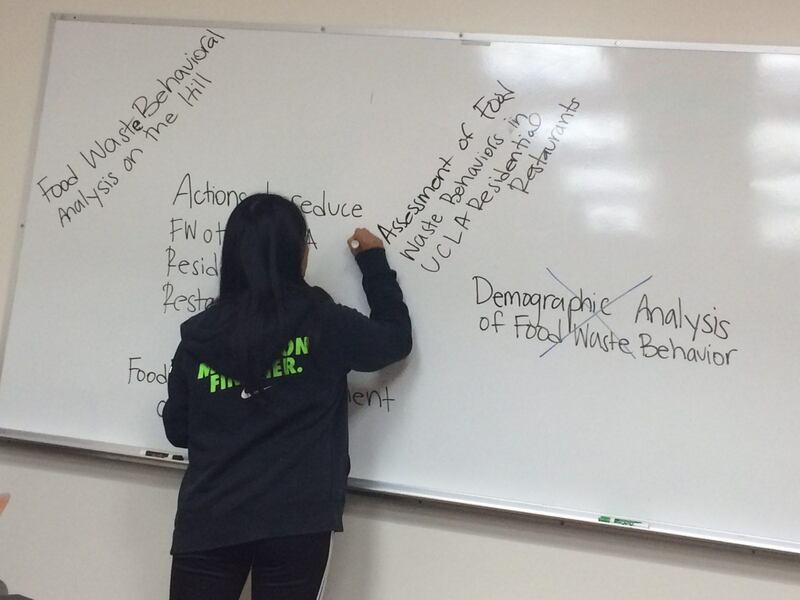 After several weeks of deliberation, we finally have a detailed and professional name for our project: Assessment of Food Waste Behaviors in UCLA Residential Restaurants. This week, we sat down and hashed out all the details for the upcoming weeks. We have a lot of educational outreach programs coming up so we divided up the workload for our research poster, which will be used for our educational segment with dining hall managers, Undergraduate Research Forum, and the final SAR presentation. Along with the poster, we will be showing the final cut of our Food Waste Awareness video at the final SAR presentations. We made our final comments and edit suggestions this week, along with the specific statistics and tips we want on our video. For the rest of the week, we each have individual tasks to accomplish before we submit our poster for printing. While we did collect demographic data in winter quarter, we decided that we need a set of eyes that can decipher trends in our data so some of our team members will be taking our data to a statistician for review. Currently, we see some trends in demographics and food waste and but we will verify our findings with the statistician to make sure the food waste behavior relates to actual food waste. While we now have a more professional name, our team goal remains the same. We will be trudging along for our efforts in reducing food waste in residential restaurants. Although, colloquially, we still like to call ourselves the Foo(d) Fighters.